In the “First steps with DxO OpticsPro 10” tutorial, you learned that as soon as you open your images, the software automatically applies a default preset that corrects tone, color, and noise, and also applies the DxO Optics Module adapted to your equipment so as to correct optical defects and optimize image sharpness. And again, these operations are entirely automatic. Of course, DxO OpticsPro 10 also lets you manually correct your images by using the many tools in the Customize tab. In this tutorial, we will follow a classic correction workflow by going from white balance all the way to cropping, going through corrections for tone, hue, noise, sharpness, etc. The Customize tab with all of the tool palettes displayed. When you open DxO OpticsPro 10 for the first time, and in particular the Customize tab, only one single tool palette will be open by default: Essential Tools, where you will find the tools that we will be discussing in this tutorial. The Customize tab contains all DxO OpticsPro’s correction tools. The palettes are divided to the left and right of the Viewer, and the Image Browser below displays the contents of the folder or the project that you select in the Organize tab. The Customize tab when opened for the first time in DxO OpticsPro 10. If you have any difficulties understanding how any of the DxO OpticsPro tools work, click on the “?” pictogram in the upper right corner of the palettes and sub-palettes to display an explanatory note about the relevant tool. The Essential Tools palette brings together all of the basic tools that are necessary for processing your images, in case you prefer working on them manually or if you want to make adjustments to the automatic corrections. All of these tools can also be found in other dedicated palettes that contain additional tools in the same category: Light, Color, Detail, and Geometry. The Essential Tools palette with all of the tool sub-palettes displayed. 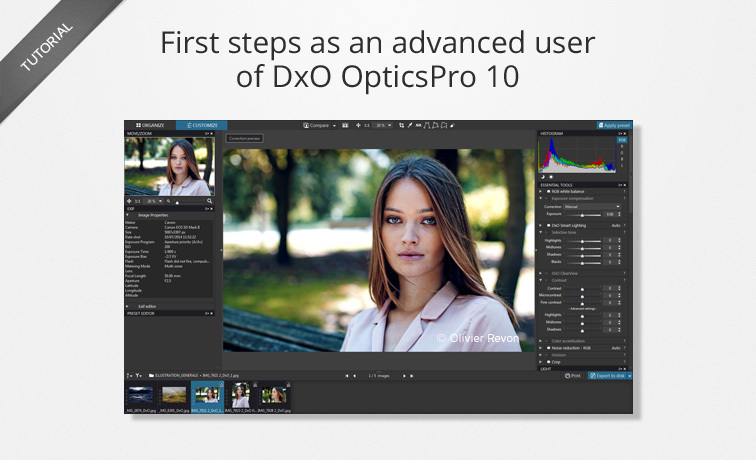 DxO OpticsPro 10 automatically corrects images as soon as they are opened in the application. Of course, you can adjust the corrections after they’ve been applied, but you can also modify the behavior and settings of the automatic corrections themselves. Technically, the order of the corrections is not set in stone: the end results will be the same. Nevertheless, for a consistent workflow, we recommend that you follow the order suggested here. 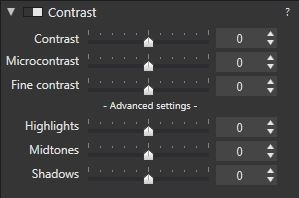 By default, DxO OpticsPro 10 uses your camera’s white balance settings. Correcting the white balance lets you accurately recreate the colors of the scene you’ve photographed, or to neutralize a dominant that can be introduced by certain light sources. Click on the eyedropper icon in the sub-palette or in the upper toolbar. Move the mouse pointer (now in the form of an eyedropper) into the left-hand image and click on a neutral area (white or gray). Validate by clicking on Close (on the bottom right under the Viewer). 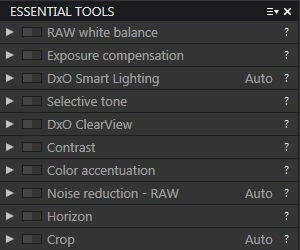 If you are having trouble finding a neutral area in your image, or if you have trouble correcting white balance generally, you can try one of the presets in the Setting menu (depending on the lighting of the scene: Daylight, Cloudy, Tungsten, etc. ), or make adjustments using the Temperature and Tint sliders. Tone encompasses everything that concerns the exposure or the luminosity of an image, with the goal of exploiting the full tonal range of the image — i.e., the information contained in the shadows, highlights, and midtones. To accomplish this, DxO OpticsPro 10 offers you a large number of tools with different automatic modes, such as Exposure Compensation (which affects the overall exposure of the image) and DxO Smart Lighting (which optimizes the dynamic range), along with more traditional tools such as Selective tone, whose sliders let you act on the different tone ranges in the image, and the Tone Curve. 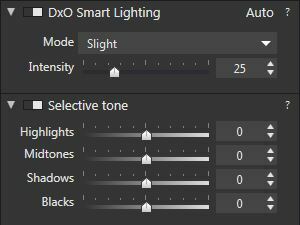 In the DxO Smart Lighting sub-palette, select in the Mode menu the Medium or Strong setting, which will brighten the darker parts of your image. 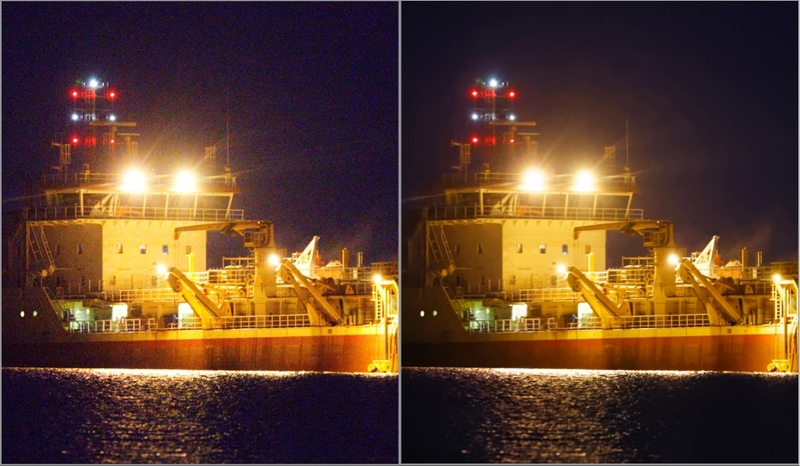 As this correction will slightly augment the luminosity of the sky, go to the Exposure Compensation sub-palette and choose Highlight Priority – Medium in the Correction menu. 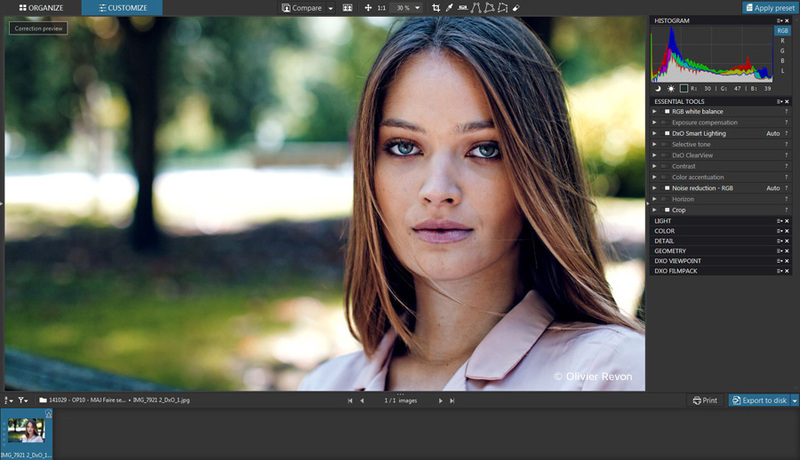 You can refine these two corrections manually by using the Exposure and Intensity sliders. The Exposure Compensation and DxO Smart Lighting sub-palettes. Correcting with Exposure Compensation and DxO Smart Lighting keeps the details in the sky and brightens the urban landscape without altering the mood of the photo. 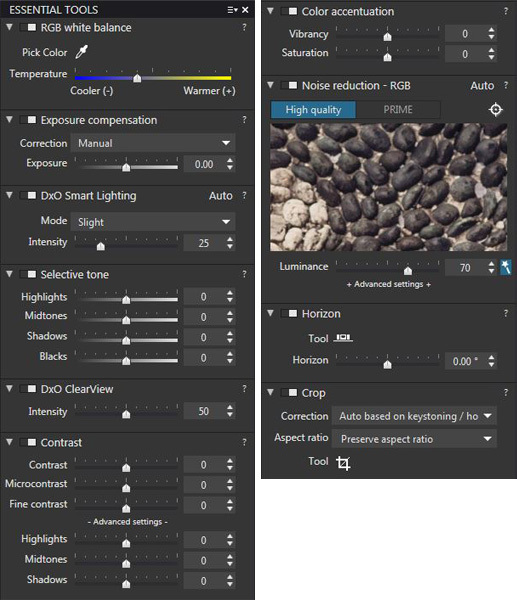 Starting with DxO OpticsPro version 10, you can now apply according to your own tastes DxO Smart Lighting settings from versions 9 and 7, available in the drop-down menu in the corresponding sub-palette. The Contrast sub-palette contains two tools that are radically different in the way they are used. The first slider, Contrast, lets you adjust the difference between the brightest and the least-bright elements in the image. 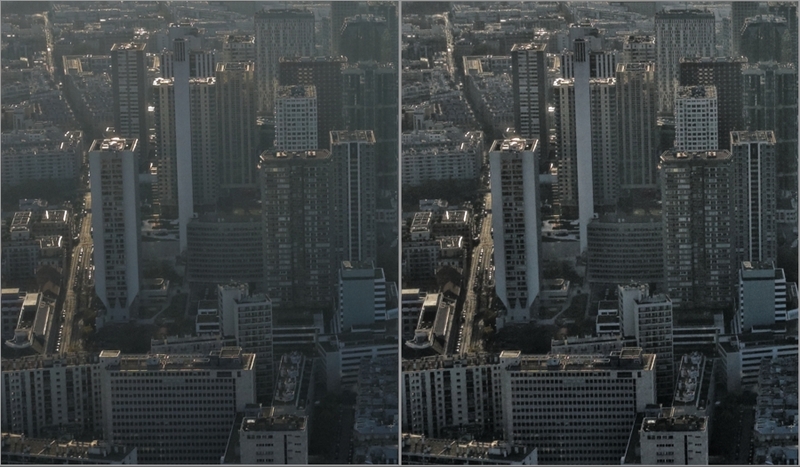 Since the previous step (using the Exposure Compensation and DxO Smart Lighting tools) sets the global contrast, we are going to focus more particularly on the second slider, Microcontrast. This slider acts in a localized manner, letting you strengthen the presence and texture of the micro-details in the image, resulting in more “punchy” renderings for architectural, landscape, industrial, and other kinds of photos. Conversely, if you set the slider to negative values, the micro-details will be more diffuse, which can be useful for softening portraits. 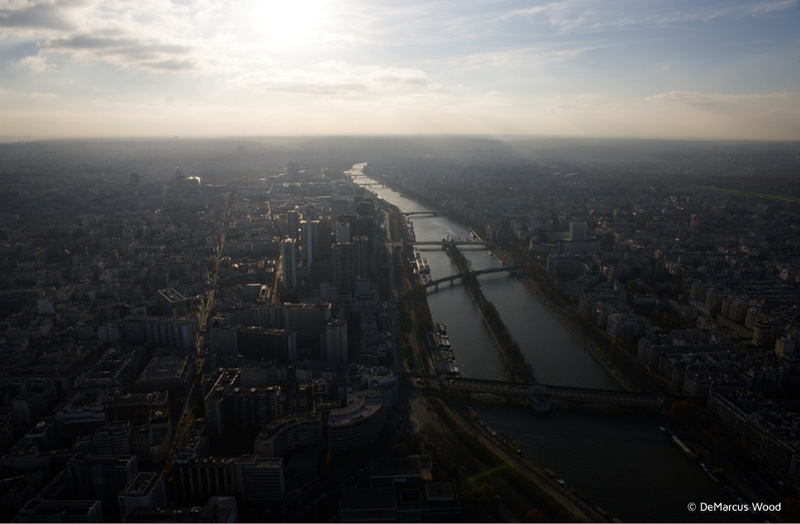 The Microcontrast slider lets you boost the details in the image (here enlarged to 100%). A third tool, Fine Contrast, has a softer effect than Microcontrast because it acts on medium-sized details, and is available if you use DxO FilmPack 5 as a plugin for DxO OpticsPro 10. Vibrancy: Use this tool to bring out the colors, notably the blue of the sky, without excessively affecting the other colors in the image. 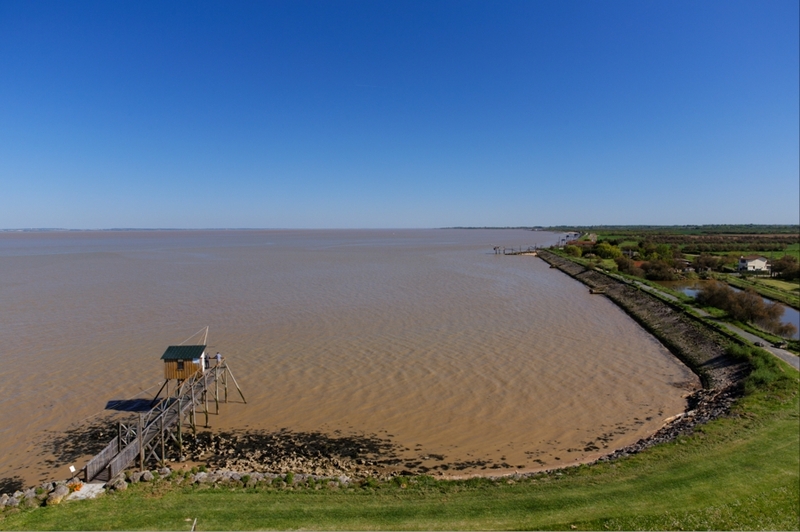 Saturation: This slider increases or desaturates all of the colors in the image, without making any distinctions. Color accentuation with the Vibrancy slider. Digital noise affects images more and more as the ISO sensitivity increases. It manifests as graininess (luminance) and as clusters of colored pixels (chrominance noise), notably in the dark areas of the image. As soon as your image opens in DxO OpticsPro 10, the High Quality noise reduction is automatically optimized for the kind of camera and the ISO sensitivity you use. High Quality mode is suitable for most photos, or for when you need to work quickly. 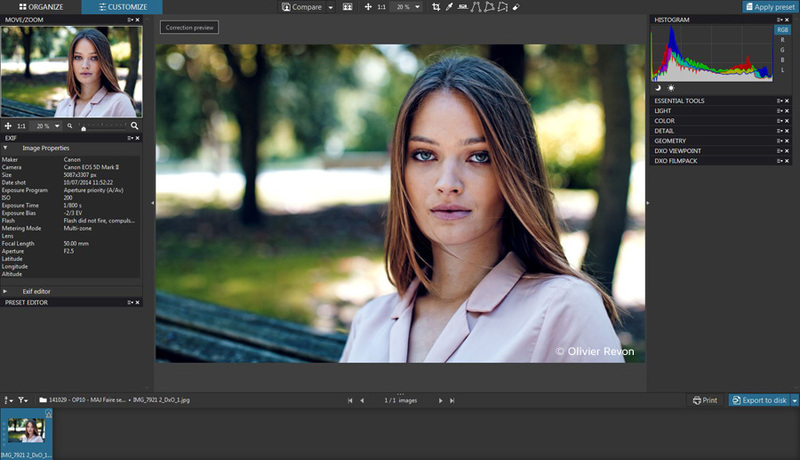 However, DxO OpticsPro 10 also offers a new denoising technology, DxO PRIME, that is even more effective, since it makes it possible to preserve the all the details as well as the color fidelity. DxO PRIME can be used for images at very high sensitivity (above 3200 ISO) — such as for shots of night-time sports and shows, etc. It can also be used for photos taken at lower sensitivities and thus with lots of noise in the shadows, which can be a problem when you try to brighten the dark areas. In such cases, DxO PRIME will correct the noise perfectly while guaranteeing the preservation of image details. Activate the side-by-side display in the upper toolbar to be able to easily compare the corrected image with the original. In the Noise reduction sub-palette, verify that High mode is activated (you may have to click on the corresponding button). To smooth out the grain a bit more, move the Luminance slider to the right (excessive settings will affect the details in the image). By default, the Chrominance and Low frequency sliders are at their maximum settings (100%). Diminishing the values will only reintroduce noisy pixels and colored artifacts. To return to the automatic correction setting, click on the magic wand to the right of the relevant slider. 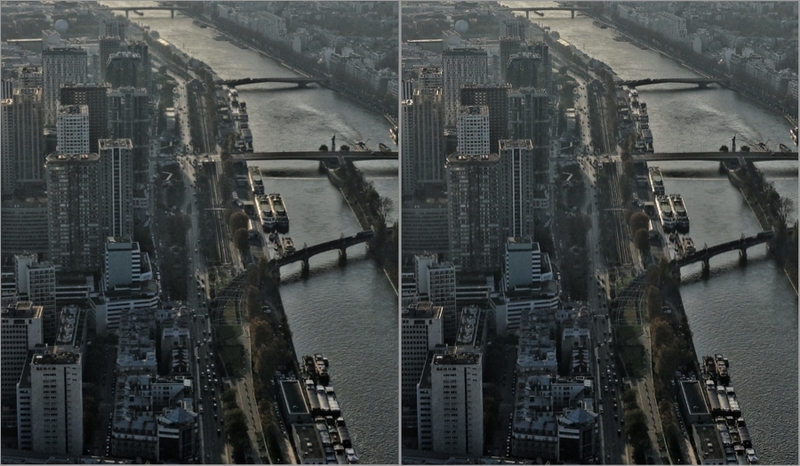 Comparing the original image (left) and the image processed with High Quality denoising (right) at 100%. 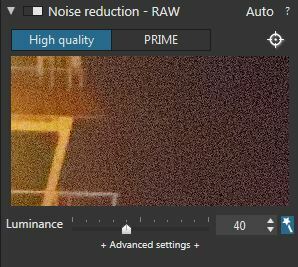 Click on the PRIME button in the Noise reduction sub-palette. Next, click on the Magnifier center button on the upper right of the preview pane. Place the Magnifier center frame in a place in the image where you would like to see the effects of DxO PRIME denoising. Animated circle arrows in the preview pane indicate that DxO PRIME is processing the noise reduction in the chosen area. If you select another location, or if you change one of the setting sliders, DxO PRIME will resume its calculations, as evidenced by the indicator in the preview pane. 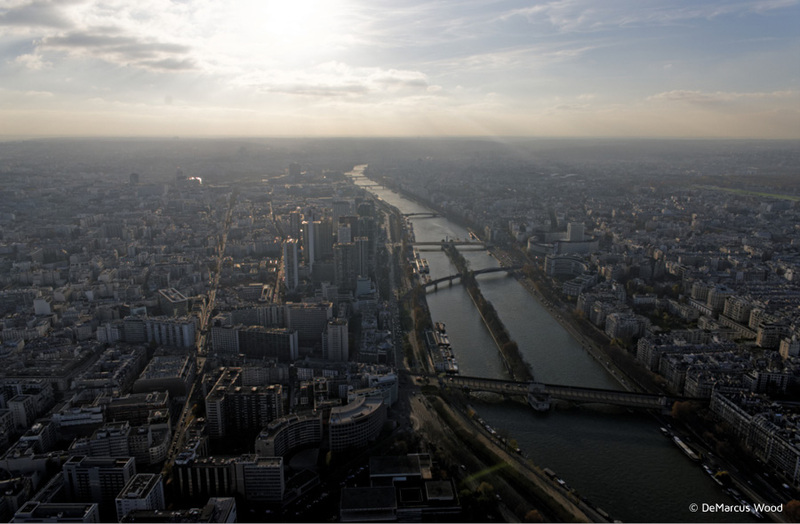 To apply the denoising to the entire image, you will need to export it. DxO PRIME noise reduction lets you achieve much greater quality by completely eliminating granulation while still preserving the image details and original colors. DxO PRIME noise reduction is applied exclusively to RAW flies, and requires relatively long processing times. Go to the Detail palette, and then into the Lens Softness sub-palette. You can strengthen or diminsh the overall sharpness by using the Global slider. The Details slider acts on the sharpness of the small details and textures. The Bokeh slider limits the accentuation of the artifacts in the background. By pushing the Global slider a bit more, you can achieve an image that is even more detailed, crisp, and sharp — without artifacts. 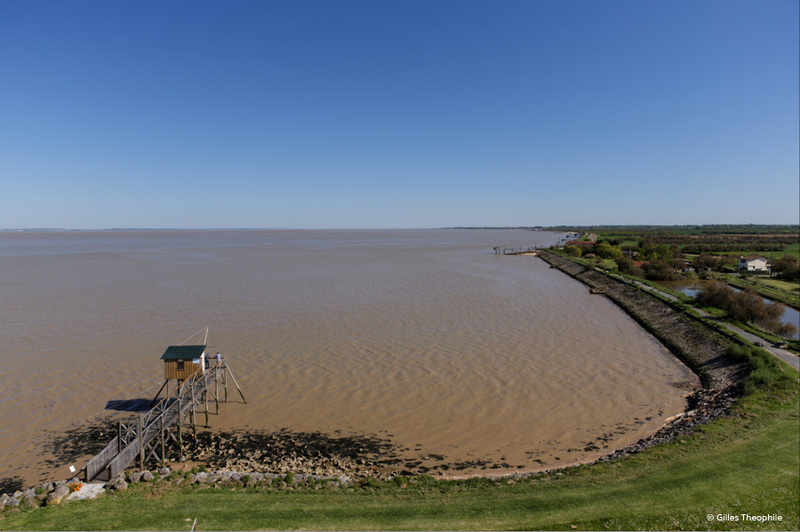 On the left, the image showing the results of the sharpness default setting (enlarged to 80%). If your equipment is not yet supported by a DxO Optics Module, you can still enhance the sharpness by using the Unsharp Mask sub-palette (in the Detail palette). Click on the Horizon button in the upper toolbar. The horizon line will appear on your image; you can place the two handles on the reference line that you desire. You can then preview the correction, and reset it if necessary. Click on Apply on the lower right to validate. The mouse pointer changes into a cross as soon as you place it in the image. Hold down the mouse button to draw a frame within the image, and then release the mouse button. You can adjust the size of the frame to your liking by using the handles on the sides and in the corners of the frame. You can change your image composition by moving the crop frame within the image. The height-to-width ratio of the original image is respected by default, but you can use the Aspect Ratio menu in the toolbar below the image to select a different ratio. To validate, click on Close on the lower right. 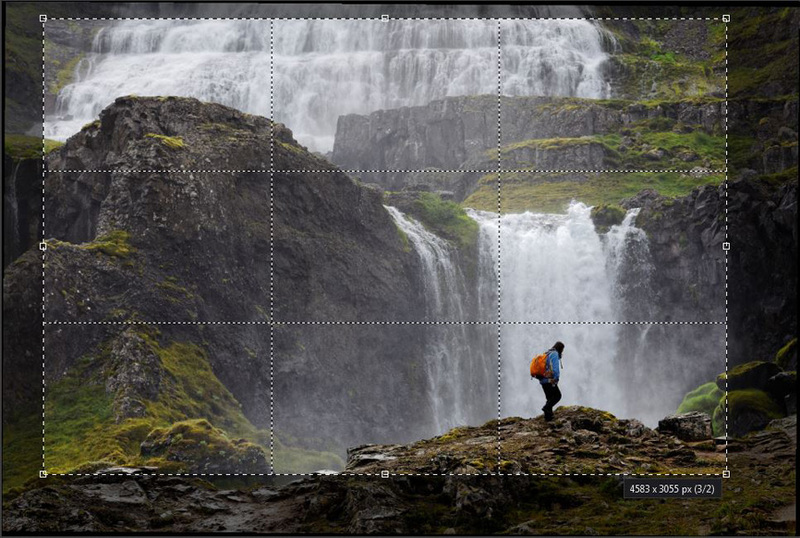 The Crop tool with the “rule of thirds” grid. 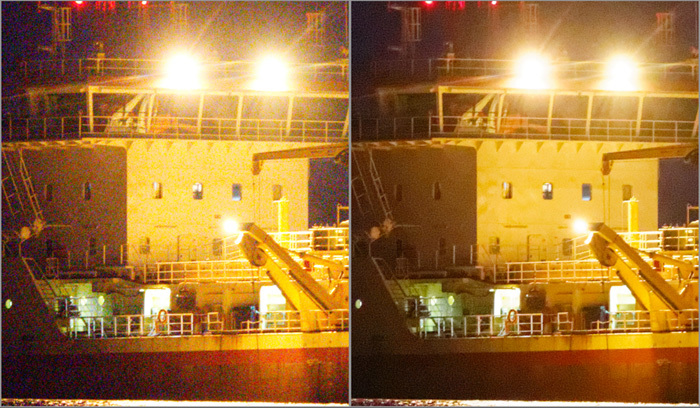 The original image (left) and the straightened and cropped image (right). We have just gone over some of the most common corrections that photographers are most likely to use, either to refine the automated corrections of DxO Optics Pro’s default preset and DxO Optics Modules, or to manually control corrections partially or completely. Of course, we’ve only just touched on some of the many possible ways to use DxO OpticsPro 10 to correct images, which not only consists of the tools presented here, but also many other tools that let you eliminate dust specks, convert your color images to black & white, apply different renderings, etc. To find out more, we invite you to go to the DxO Academy page, where you will find many more specialized tutorials, recorded webinars, and the user guides.